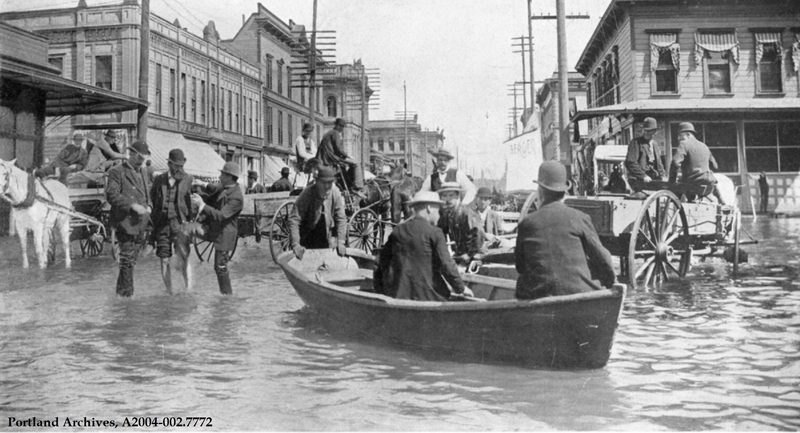 Downtown Portland routinely experienced high water and this photograph from 1894 captures the challenges and adventures of flooded streets. This image was taken on Front and Morrison St. and comes from the book, Portland: Its History and Builders, Volume 1, by Joseph Gaston. Are we sure this is Front and Morrison? Shouldn’t we be seeing the St. Charles Hotel? @Jim, I’m pretty sure that the St. Charles was on the SW corner of the intersection, to the left and just out of this view. So, is the first intersection in front of us Alder and Front (looking North)? Here’s a grid of the area with Hotels highlighted (though it’s 1910). It’s really great to see an unstaged moment in a day 120 years ago, capturing the flood, but providing a feeling of meeting these folks from an era past in a city we share. I’m with Jim. The building on the immediate left should be the four story St. Charles Hotel and the building on the right would/should be the Esmond Hotel. Neither of which are in this photo. Because I don’t (won’t) belong to Facebook, I can’t access the photo in Ken’s link, but is it possible that this photo is of an earlier flood that predates the 1869 St. Charles Hotel and 1879 Esmond Hotel? Perhaps the December ’61/January ’62 or 1866 flood? I’m not trying to be a pain, Ken (I know you know your stuff), I’m just trying to figure this out. Considering the power poles/lines shown in the picture I’d think the 1894 date is correct. The white horse on the left looks almost like its TOO white compared to everything else. The other white horse on the far right would be standing in the lobby of the 1887 Jennings Furniture Building if we were looking at the intersection of Front and Morrison. I think the horse is in the shadows and the person who printed the negative lightened up that shadow area by giving it more printing light (early Photoshop). Overdid it a bit. I posted in haste yesterday morning. The photo in our group is an early one of the Western Hotel at *First* and Morrison. Its framing looks similar to the building at right and I made the connection by mistake. That said, I agree that the photo here itself does not appear to be Front and Morrison, especially since it shows three of four corners of whatever intersection it depicts. If it was looking north or south on Front or west up Morrison, then the recognizable St. Charles Hotel with its mansard roof would be in the photo. And its definitely not looking east on Morrison. I’ve got it! It’s <a href="https://vintageportland.wordpress.com/2010/11/22/boston-packing-co-building-1928/"Third and Ankeny looking North up Third. You can see the Neppach House on Burnside, and it’s sister building (and still extant), Sinnott House further up on Couch. Let’s try this again: 3rd and Ankeny. Nice find, Jim! That’s not even close to Front and Morrison; I wonder how that location ever came to be associated with the photo.